Democratic policies make unemployment worse. Kevin Hassett authored a piece entitled Recession Blues in National Review (June 22, 2009). It presented data in graph form showing unemployment rates in April 2009 across the fifty states sorted by each state’s political history. Those states that have been solidly in the Democratic party since the 1980s showed the highest overall unemployment at 9+%, the extreme left bar on the below graph, Table 1. By contrast those states which have been solidly in the Republican party for up to 30 years showed the lowest overall unemployment at about 6.66%, the far right bar on the same graph. Four groups of states are distributed between these two extreme groups which show the same pattern of high blue and low red states. The two middle bars represent states that switched from one party to the other since the year 2000. 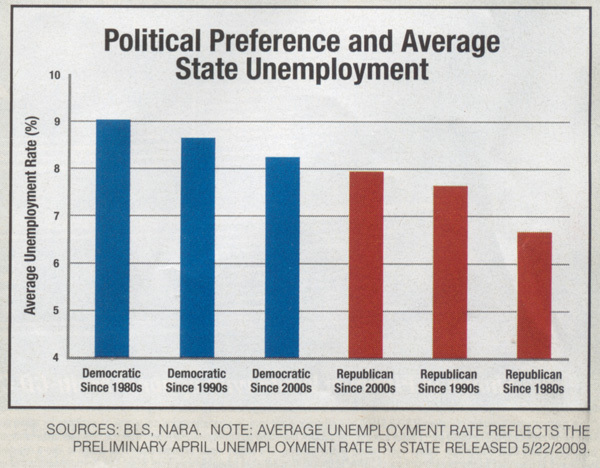 While each bar represents a group of states, the pattern overall is clearly evident, that unemployment is more likely to occur in Democratic than in Republican controlled states, even for those states that recently switched. By all measures, these gross unemployment rates are significantly different from each other. This lends serious weight to the idea that a political culture is for better or worse, and unemployment data is one indicator of each culture. Table 1 shows a clear progression of unemployment data from left to right, high unemployment on the left to lower unemployment on the right. What is significant about this is that the three Democratic group states (blue) are each higher than the three Republican group states (red). What is not visualized is the very likely dynamic effect of tenure, or time in office of each party, which may be the most important revelation of the data. Table 1 blurs this clear dynamic effect because the time lines of the red and blue states are reversed on the table. From the data, it is clear that the longer a culture is present, the greater the influence of that culture. This is highlighted below. The same graph is reproduced in Table 2, with the addition of two arrows indicating the influence of tenure or time in office. 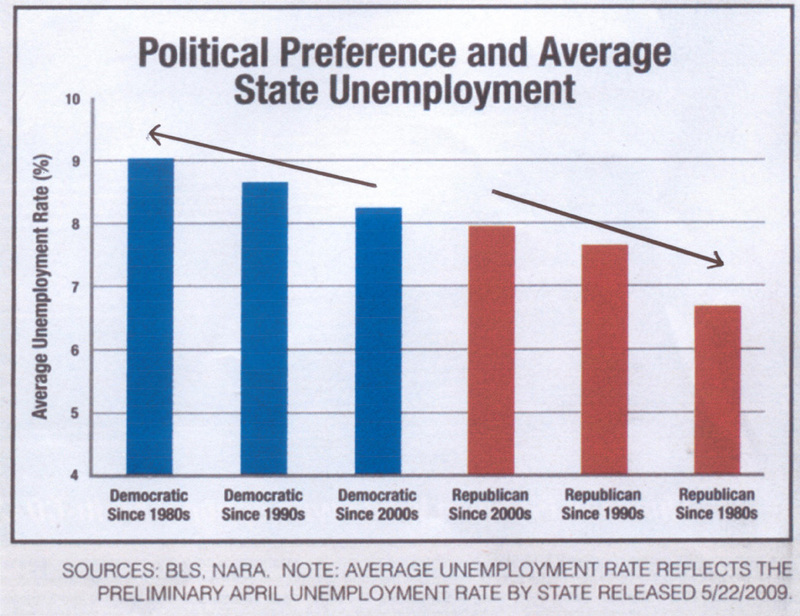 When Democrats are in power, unemployment in those states rises, from right to left as shown by the direction of the arrow on the graph. This influence covers a period of up to almost 30 years to the present. For Republicans the opposite is true. The longer they remain in power, the lower the unemployment rate as shown by the arrow over the red bars. Hassett’s interpretation of the data is that “Democratic policies effectively spread human misery. President Obama now has the political power to do for the nation what Democrats have done for Detroit and California”. As one who worked with unemployed persons for years, there are both humanitarian as well as negative dimensions to unemployment when benefits are attached. While the laws are generally similar across the states, the benefit rates vary from state to state. For instance it is likely that those states with higher unemployment also pay higher benefits than those states with low unemployment. This is similar to welfare benefits in the 1990s and earlier when recipients migrated from states with low benefits to those with higher benefits. For example, California did not adopt the 1990s welfare reforms until this year, when they found themselves 26 billion dollars in the red. Knowing the difference between the parties’ philosophies, it is likely that the Democratic states are far more lenient in allowing benefits, in interpreting the law, or in lax enforcement of the rules. In the worst case, Democratic states’ unemployment programs may ignore the intent of the law entirely, and pay benefits out of humanitarian concern. We currently have a Supreme Court judge nominee whose humanitarian concern (empathy) is alleged to rise above her decisions based upon the constitution and the rule of law. It is far more likely, for instance, that California’s unemployed include more illegal recipients, more fraudulent recipients, and certainly more unusual recipients of benefits. Seasonal fruit pickers, for example, may be well justified. Hollywood actors who collect a million dollars under an employment contract for six months and then become unemployed to draw benefits for the next 27 weeks would seem to be an abusive entitlement to benefits which increases employer costs. Such increased costs encourage employers to move to other states. These are the rules in California. It is not at all unusual for an individual who is employed full time to receive unemployment benefits at the same time! While this is deliberate and outright fraud, all government programs are subject to such abuse. In California the question is determining exactly how much of the benefits paid are not legitimate, and how much is legally working the system by those in need. Whatever the many interacting influences, over time unemployment clearly becomes worse under Democratic administrations, and better under Republicans. This is likely the byproduct of a healthier state economy the longer Republicans are in power. If one is concerned with unemployment, the choice is quite clear as to whose policies enhance the future. Maryland has discovered that you can try to soak the rich, but the rich know how to swim across the Potomac. Faced with a budget shortfall, Maryland’s state legislators enacted a higher tax bracket for millionaires—6.25 percent on top of federal and local taxes. One-third of Maryland’s millionaires vanished from the tax rolls, many seeking haven in Virginia, Delaware, and Florida. The result: Even with the higher rate, Maryland is now collecting $100 million a year less from the guys in monocles and top hats. Capital is mobile. So are capitalists. Next to Maryland and Virginia is our illustrious national capital, Washington D.C., a seething cauldron of stealth and special interests. A comparable collection of Democrats is currently fuming over how stick it to millionaires through federal taxes. Higher taxes is always their answer! The federal Democrats are unable to learn from their Maryland counterparts from the above clear example. When you increase taxes actual revenue to the government drops precipitously. This means government money to spend goes down. Pay attention!!!! It is this perplexing and convoluted sort of thinking that Democrats refuse to understand. This is because their feelings overtake their judgment, and they go with the gut, the voter on the dole every time. Their brains are permanently buried where the sun don’t shine. If Democrats were truly interested in helping the unemployed, they might try to understand what the Republicans have been practicing for years. When the chips are down, Democrats morph into the Tin Man in the Wizard of Oz. If they only had a brain! Why is it that the Democrats’ so-called compassion and empathy causes more suffering?